Does anyone know if the correct oil filter for a 67 Camaro 350 is a bolt on cannister with the paper PF-141 inside? I believe Chevy went to a spin o filter in late 67 and for 68 on! 1968 was the change-over from the canister to the spin-on however, there were some engines early in 68 that continued to use the 67 engine, therefore the 67 canister. 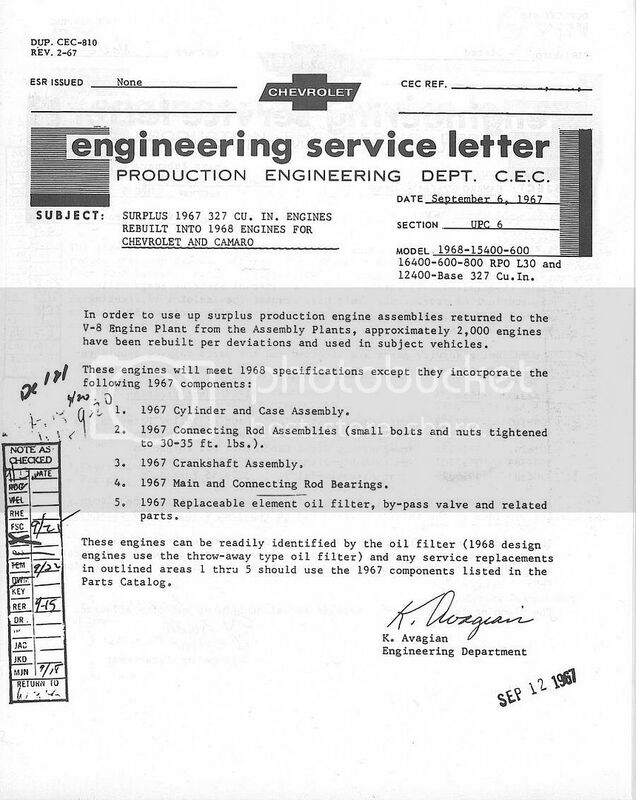 This is documented in the September 6th, 1967 Engineering Service Letter (attached). There was also an adapter that you could purchase to convert your 68 (and later) "spin-on" block back to canister! There were a lot of companies and police departments that had a stockpile of canister filters that didn't want to have to toss them and go to the spin-on. The P/N for that adapter is 3916328. Thanks ED! I thought so because my block (67) is machined differentyly than 2 68 blocks I have that use a spin on filter!